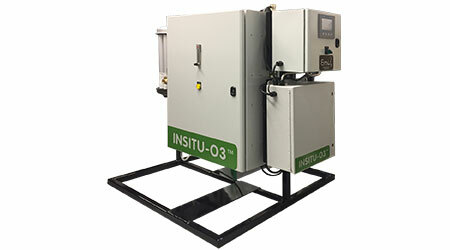 INSITU-O3TM system for cooling tower water treatment generates ozone on-site (insitu), removing the need to handle and store hazardous chemicals. It produces 60 g/hr of ozone. Eco-friendly and more efficient than chemical biocides, the ozone generated in the water destroys bacteria including Legionella, eliminates biofilm, and corrosion-causing microbes. A low concentration of ozone in water (0.1 ppm) with a contact time of 5 minutes has a 99 percent kill rate of Legionella. This protection, combined with the oxidizing properties of ozone, extends the service life of equipment, improves heat transfer efficiency, reduces energy consumption and decreases the frequency and cost of upkeep repairs. Models also available from 10 g/hr to 200 g/hr. The unit controller has data-logging capability and full water management function. The skid-mounted system can process up to 240 GPM.